It got a chuckle out of me…an outright burst of laughter from the rest of the room. My children, after four years of my working at my job, had never come to my work and actually seen what I do every day. They had been visiting a museum and decided to stop by and say hello. When they reminded me they’d never seen a newscast and how it operates I figured the least I could do was let them do that. The boys were amazed. When robotic cameras went moving around on the floor unaided by human hands the boy up there was awestruck. When they met the anchors they see on the television they were . . . well . . . awestruck again. When they saw the editing booths, the cameras, the giant empty studio we use for everything else they were flabbergasted. “Which is your desk,” they had asked me after the tour. “The one with what looks like a shrine to you four,” a colleague informed them. I hadn’t thought about it, but yes…I have a lot of pictures of my kids sitting on my desk. I’m very proud of them. They have persevered through a lot of terrible, horrible things and they aren’t at all bitter about it. Not to say that I haven’t been informed of the major limitations of my parenting abilities by, particularly, my two daughters. There are a lot of things about raising girls that you really need to have a woman around to help you with and I just didn’t. It was better, though, for me to stumble along than to bring someone in with no connection to them whatsoever just so they’d have a female adult in the household. I stand by that decision. “This is so cool,” my sons said of the television station where I work. “I thought you’d all been here before,” I told them. “Well, yeah, but we didn’t really get to see anything,” they told me. Their older sister wasn’t as impressed. When she was a toddler she was in live shots and segments for the news all the time. I worked in a consumer unit and we always needed video of a kid doing something or a home for a backdrop, which was always mine. It was second nature for her to be on television. Your work is so cool, said my middle daughter. “So are the people you work with. Tell them we said that!” she added. “Dad’s cool, too,” said my son. “Nah…I’m just Dad,” I told him. “No…you get to do all these things, you changed a law, you play guitar, you are in a band with a guy that played with all these famous people…you’re pretty cool,” he told me. My kids got to see that my out-of-home life was far more complex and intense than they thought. It was a wonder to them that I get to do all this stuff and then still come home and quote Monty Python to them. 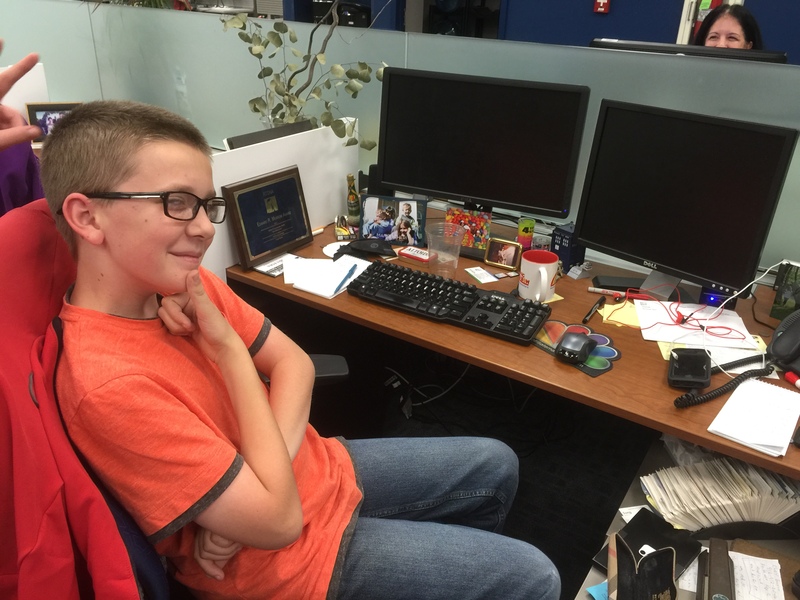 I was just starting to bask in the admiration of the “coolness” they’d bestowed upon me when my other son decided to copy his Dad at the desk.